The NY Times reports on the growing skepticism regarding the benefits of various energy drinks. The latest article comes just two months after the NY Times reported on an official F.D.A. letter that suggests the F.D.A. is considering a proper scientific investigation—perhaps, one can hope, an evidence-based clinical study conducted by scientists whose research is not funded by some energy drink. The latest NY Times article sounds incredibly familiar. 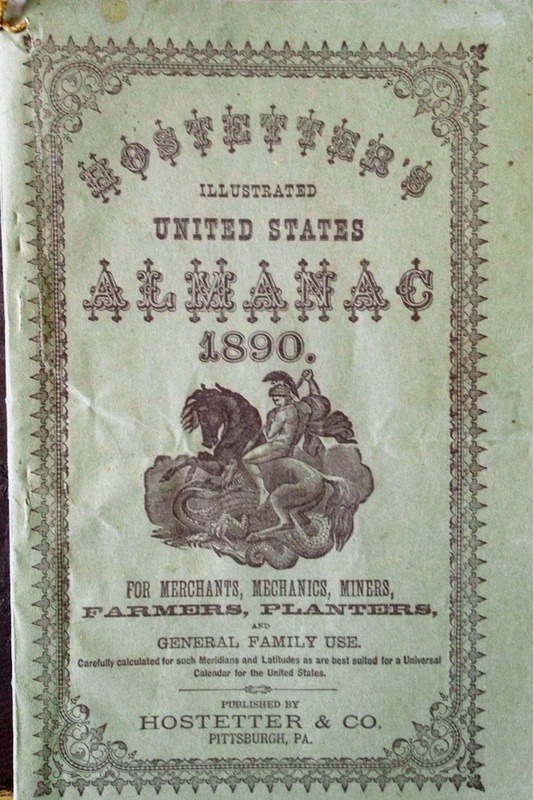 It could be 1905 all over again, and Samuel H. Adams could be spearheading yet another muckraking campaign to topple the patent medicine industry. This line of marketing should sound familiar. 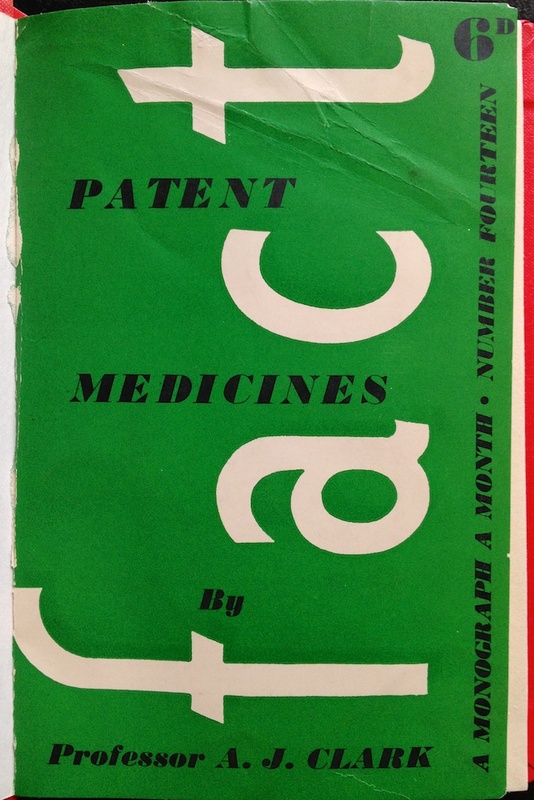 The patent medicine industry in the 19th- and early 20th-centuries used similar techniques to sell alcohol disguised as medicine (on patent medicines, see this post and this one and this one and this one and this one). It would be amusing to update Samuel Adams’s diagram that showed alcohol content in patent medicines to show caffeine content in energy drinks. 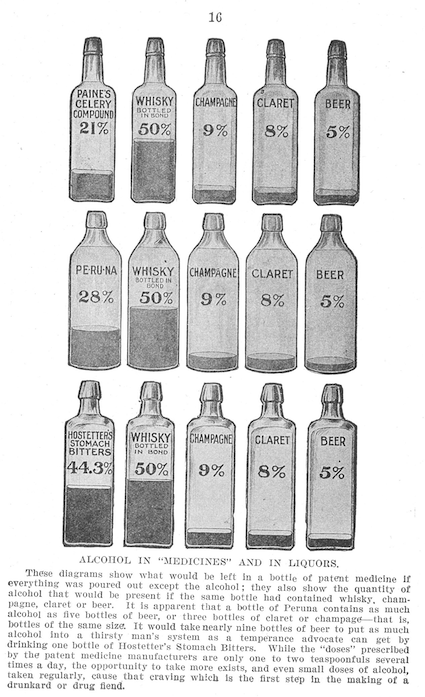 Illustration showing the alcohol content of different patent medicines (Source: Samuel Adams, The Great American Fraud (1906), 14). 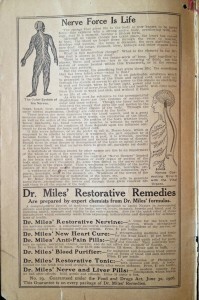 Dr. Miles’ Restorative Remedies promised to cure all sorts of ailments. 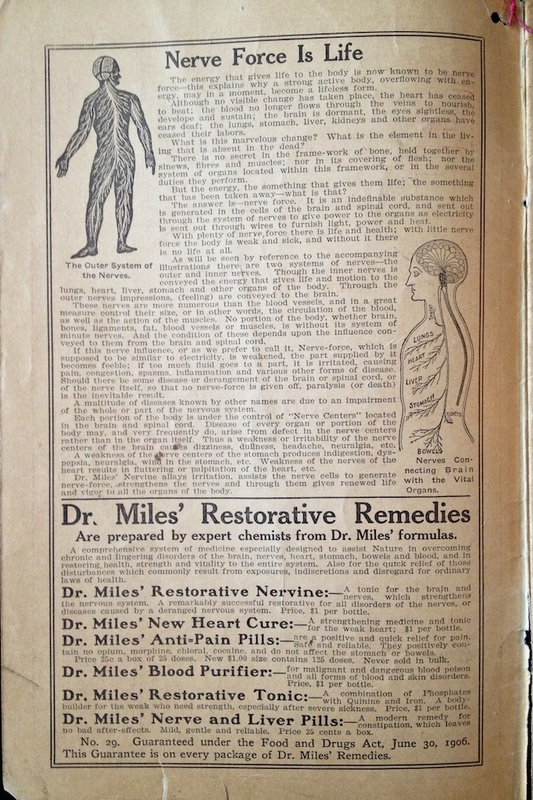 Hostetter’s Stomach Bitters claims to restore vigor—“the ability to eat with apetite, to digest with thoroughness, to think clearly, to sleep soundly, to undergo moderate exertion without excessive fatigue”—and while it won’t “give you wings” at least will give you the strength to slay dragons. 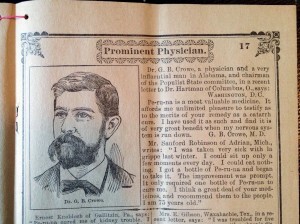 Hostetter’s Stomach Bitters contained 44% alcohol—that will make you feel better. 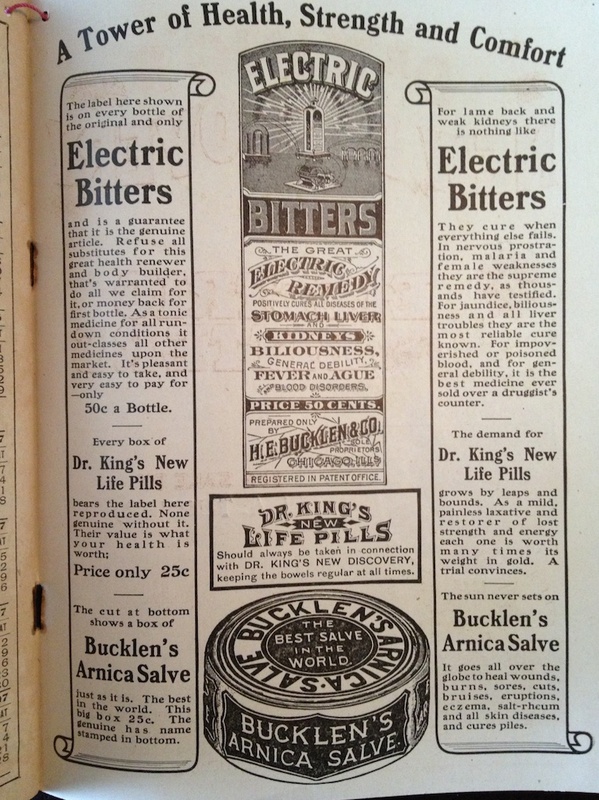 Dr. King’s New Life Pills is both “a mild, painless laxative and restorer of lost strength and energy.” Lest the consumer not trust these claims, patent medicine companies enlisted the testimony of physicians and other experts. 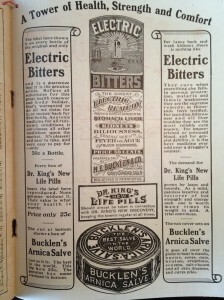 Dr. King’s New Life Pills and Electric Bitters promised to cure when everything else failed and to restore lost strength and energy. Pe-ru-na is a most valuable medicine. It affords me unlimited pleasure to testify as to the merits of your remedy as a catarrh cure. I have used it as such and find it is of very great benefit when my nervous system is run down. 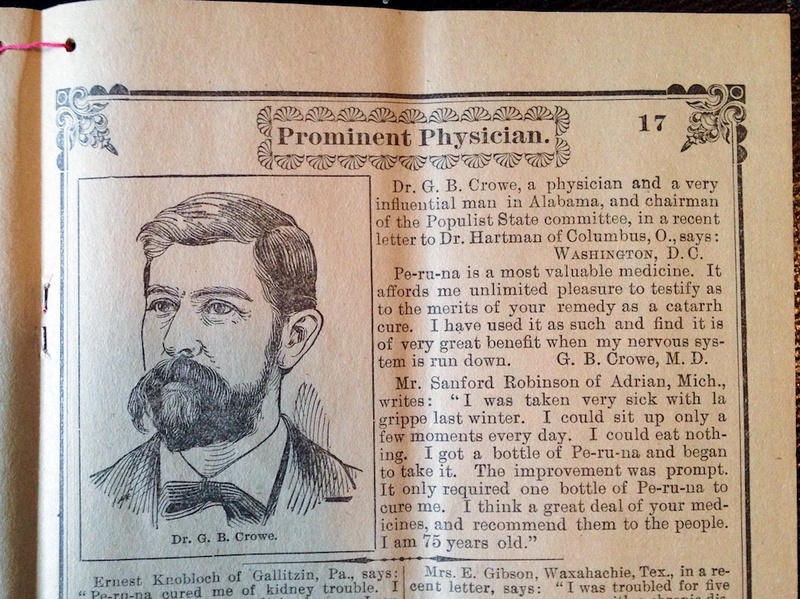 Peruna recognized the value of having a physician’s endorsement. Despite cheaper alternatives and no evidence that the secret ingredients work, energy drinks will likely survive this latest challenge, just as patent medicines survived Samuel Adams’s muckraking work—three decades later Professor A. J. Clark noted in his Patent Medicine (A Monogram a Month—Number 14) that the proprietary medicine trade was between £20-28 million per year and showed no sign of decline. Perhaps we need sharper tools than evidence and clinical trials. Those were not sufficient a century ago. It remains to be seen if they are effective today. A. J. Clark’s Patent Medicines (1938) pointed out that the trade was still flourishing in England and showed no signs of decreasing. Great post..I read this article today and appreciate your thoughts on it. The caffeine (and cost) comparisons are quite telling. Thanks for the comment. I stopped by a convenience store today to see what the prices were on various energy drinks. Given my preference for coffee and my desire to save money, I am happy to report that per milligram coffee is less than half the cost of the next cheapest drink. I’ve updated the post to reflect the costs.